GATE2 is an infrastructure for developing and deploying software components that process human language. It is nearly 15 years old and is in active use for all types of computational task involving human language. GATE excels at text analysis of all shapes and sizes. From large corporations to small startups, from €multi-million research consortia to undergraduate projects, our user community is the largest and most diverse of any system of this type, and is spread across all but one of the continents3. GATE is open source free software; users can obtain free support from the user and developer community via GATE.ac.uk or on a commercial basis from our industrial partners. We are the biggest open source language processing project with a development team more than double the size of the largest comparable projects (many of which are integrated with GATE4). More than €5 million has been invested in GATE development5; our objective is to make sure that this continues to be money well spent for all GATE’s users. a process for the creation of robust and maintainable services. GATE version 1 was written in the mid-1990s; at the turn of the new millennium we completely rewrote the system in Java; version 5 was released in June 2009. We believe that GATE is the leading system of its type, but as scientists we have to advise you not to take our word for it; that’s why we’ve measured our software in many of the competitive evaluations over the last decade-and-a-half (MUC, TREC, ACE, DUC and more; see Section 1.4 for details). We invite you to give it a try, to get involved with the GATE community, and to contribute to human language science, engineering and development. Section 1.6 lists other publications about GATE. The material presented in this book ranges from the conceptual (e.g. ‘what is software architecture?’) to practical instructions for programmers (e.g. how to deal with GATE exceptions) and linguists (e.g. how to write a pattern grammar). Furthermore, GATE’s highly extensible nature means that new functionality is constantly being added in the form of new plugins. Important functionality is as likely to be located in a plugin as it is to be integrated into the GATE core. This presents something of an organisational challenge. Our (no doubt imperfect) solution is to divide this book into three parts. Part I covers installation, using the GATE Developer GUI and using ANNIE, as well as providing some background and theory. We recommend the new user to begin with Part I. Part II covers the more advanced of the core GATE functionality; the GATE Embedded API and JAPE pattern language among other things. Part III provides a reference for the numerous plugins that have been created for GATE. Although ANNIE provides a good starting point, the user will soon wish to explore other resources, and so will need to consult this part of the text. We recommend that Part III be used as a reference, to be dipped into as necessary. In Part III, plugins are grouped into broad areas of functionality. GATE can be thought of as a Software Architecture for Language Engineering [Cunningham 00]. ‘Software Architecture’ is used rather loosely here to mean computer infrastructure for software development, including development environments and frameworks, as well as the more usual use of the term to denote a macro-level organisational structure for software systems [Shaw & Garlan 96]. The relevant scientific results in this case are the outputs of Computational Linguistics, Natural Language Processing and Artificial Intelligence in general. Unlike these other disciplines, LE, as an engineering discipline, entails predictability, both of the process of constructing LE-based software and of the performance of that software after its completion and deployment in applications. Computational Linguistics (CL): science of language that uses computation as an investigative tool. Natural Language Processing (NLP): science of computation whose subject matter is data structures and algorithms for computer processing of human language. Language Engineering (LE): building NLP systems whose cost and outputs are measurable and predictable. Software Architecture: macro-level organisational principles for families of systems. In this context is also used as infrastructure. Software Architecture for Language Engineering (SALE): software infrastructure, architecture and development tools for applied CL, NLP and LE. In the scientific endeavours of NLP and CL, GATE’s role is to support experimentation. In this context GATE’s significant features include support for automated measurement (see Chapter 10), providing a ‘level playing field’ where results can easily be repeated across different sites and environments, and reducing research overheads in various ways. These definitions can be blurred in practice as necessary. Collectively, the set of resources integrated with GATE is known as CREOLE: a Collection of REusable Objects for Language Engineering. All the resources are packaged as Java Archive (or ‘JAR’) files, plus some XML configuration data. The JAR and XML files are made available to GATE by putting them on a web server, or simply placing them in the local file space. Section 1.3.2 introduces GATE’s built-in resource set. When using GATE to develop language processing functionality for an application, the developer uses GATE Developer and GATE Embedded to construct resources of the three types. This may involve programming, or the development of Language Resources such as grammars that are used by existing Processing Resources, or a mixture of both. GATE Developer is used for visualisation of the data structures produced and consumed during processing, and for debugging, performance measurement and so on. For example, figure 1.1 is a screenshot of one of the visualisation tools. GATE Developer is analogous to systems like Mathematica for Mathematicians, or JBuilder for Java programmers: it provides a convenient graphical environment for research and development of language processing software. When an appropriate set of resources have been developed, they can then be embedded in the target client application using GATE Embedded. GATE Embedded is supplied as a series of JAR files.9 To embed GATE-based language processing facilities in an application, these JAR files are all that is needed, along with JAR files and XML configuration files for the various resources that make up the new facilities. GATE includes resources for common LE data structures and algorithms, including documents, corpora and various annotation types, a set of language analysis components for Information Extraction and a range of data visualisation and editing components. GATE supports documents in a variety of formats including XML, RTF, email, HTML, SGML and plain text. In all cases the format is analysed and converted into a single unified model of annotation. The annotation format is a modified form of the TIPSTER format [Grishman 97] which has been made largely compatible with the Atlas format [Bird & Liberman 99], and uses the now standard mechanism of ‘stand-off markup’. GATE documents, corpora and annotations are stored in databases of various sorts, visualised via the development environment, and accessed at code level via the framework. See Chapter 5 for more details of corpora etc. A family of Processing Resources for language analysis is included in the shape of ANNIE, A Nearly-New Information Extraction system. These components use finite state techniques to implement various tasks from tokenisation to semantic tagging or verb phrase chunking. All ANNIE components communicate exclusively via GATE’s document and annotation resources. See Chapter 6 for more details. Other CREOLE resources are described in Part III. JAPE, a Java Annotation Patterns Engine, provides regular-expression based pattern/action rules over annotations – see Chapter 8. The ‘annotation diff’ tool in the development environment implements performance metrics such as precision and recall for comparing annotations. Typically a language analysis component developer will mark up some documents by hand and then use these along with the diff tool to automatically measure the performance of the components. See Chapter 10. GUK, the GATE Unicode Kit, fills in some of the gaps in the JDK’s10 support for Unicode, e.g. by adding input methods for various languages from Urdu to Chinese. See Section 3.10.2 for more details. And by version 4 it will make a mean cup of tea. This section gives a very brief example of a typical use of GATE to develop and deploy language processing capabilities in an application, and to generate quantitative results for scientific publication. Let’s imagine that a developer called Fatima is building an email client11 for Cyberdyne Systems’ large corporate Intranet. In this application she would like to have a language processing system that automatically spots the names of people in the corporation and transforms them into mailto hyperlinks. A little investigation shows that GATE’s existing components can be tailored to this purpose. Fatima starts up GATE Developer, and creates a new document containing some example emails. She then loads some processing resources that will do named-entity recognition (a tokeniser, gazetteer and semantic tagger), and creates an application to run these components on the document in sequence. Having processed the emails, she can see the results in one of several viewers for annotations. The GATE components are a decent start, but they need to be altered to deal specially with people from Cyberdyne’s personnel database. Therefore Fatima creates new ‘cyber-’ versions of the gazetteer and semantic tagger resources, using the ‘bootstrap’ tool. This tool creates a directory structure on disk that has some Java stub code, a Makefile and an XML configuration file. After several hours struggling with badly written documentation, Fatima manages to compile the stubs and create a JAR file containing the new resources. She tells GATE Developer the URL of these files12, and the system then allows her to load them in the same way that she loaded the built-in resources earlier on. Run her application on the email test corpus. Check the performance of the system by running the ‘annotation diff’ tool to compare her manual results with the system’s results. This gives her both percentage accuracy figures and a graphical display of the differences between the machine and human outputs. Make edits to the code, pattern grammars or gazetteer lists in her resources, and recompile where necessary. Tell GATE Developer to re-initialise the resources. To make the alterations that she requires, Fatima re-implements the ANNIE gazetteer so that it regenerates itself from the local personnel data. She then alters the pattern grammar in the semantic tagger to prioritise recognition of names from that source. This latter job involves learning the JAPE language (see Chapter 8), but as this is based on regular expressions it isn’t too difficult. Eventually the system is running nicely, and her accuracy is 93% (there are still some problem cases, e.g. when people use nicknames, but the performance is good enough for production use). Now Fatima stops using GATE Developer and works instead on embedding the new components in her email application using GATE Embedded. This application is written in Java, so embedding is very easy13: the GATE JAR files are added to the project CLASSPATH, the new components are placed on a web server, and with a little code to do initialisation, loading of components and so on, the job is finished in half a day – the code to talk to GATE takes up only around 150 lines of the eventual application, most of which is just copied from the example in the sheffield.examples.StandAloneAnnie class. Because Fatima is worried about Cyberdyne’s unethical policy of developing Skynet to help the large corporates of the West strengthen their strangle-hold over the World, she wants to get a job as an academic instead (so that her conscience will only have to cope with the torture of students, as opposed to humanity). She takes the accuracy measures that she has attained for her system and writes a paper for the Journal of Nasturtium Logarithm Incitement describing the approach used and the results obtained. Because she used GATE for development, she can cite the repeatability of her experiments and offer access to example binary versions of her software by putting them on an external web server. This section contains an incomplete list of publications describing systems that used GATE in competitive quantitative evaluation programmes. These programmes have had a significant impact on the language processing field and the widespread presence of GATE is some measure of the maturity of the system and of our understanding of its likely performance on diverse text processing tasks. describes the performance of an SVM-based learning system in the NTCIR-6 Patent Retrieval Task. The system achieved the best result on two of three measures used in the task evaluation, namely the R-Precision and F-measure. The system obtained close to the best result on the remaining measure (A-Precision). describes a cross-source coreference resolution system based on semantic clustering. It uses GATE for information extraction and the SUMMA system to create summaries and semantic representations of documents. One system configuration ranked 4th in the Web People Search 2007 evaluation. describes a cross-lingual summarization system which uses SUMMA components and the Arabic plugin available in GATE to produce summaries in English from a mixture of English and Arabic documents. The University of Sheffield has a long history of research into open-domain question answering. GATE has formed the basis of much of this research resulting in systems which have ranked highly during independent evaluations since 1999. The first successful question answering system developed at the University of Sheffield was evaluated as part of TREC 8 and used the LaSIE information extraction system (the forerunner of ANNIE) which was distributed with GATE [Humphreys et al. 99]. Further research was reported in [Scott & Gaizauskas. 00], [Greenwood et al. 02], [Gaizauskas et al. 03], [Gaizauskas et al. 04] and [Gaizauskas et al. 05]. In 2004 the system was ranked 9th out of 28 participating groups. describes techniques for answering definition questions. The system uses definition patterns manually implemented in GATE as well as learned JAPE patterns induced from a corpus. In 2004, the system was ranked 4th in the TREC/QA evaluations. describes a multidocument summarization system implemented using summarization components compatible with GATE (the SUMMA system). The system was ranked 2nd in the Document Understanding Evaluation programmes. describe participation in the TIDES surprise language program. ANNIE was adapted to Cebuano with four person days of effort, and achieved an F-measure of 77.5%. Unfortunately, ours was the only system participating! describe results obtained on systems designed for the ACE task (Automatic Content Extraction). Although a comparison to other participating systems cannot be revealed due to the stipulations of ACE, results show 82%-86% precision and recall. describes the LaSIE-II system used in MUC-7. describes the LaSIE-II system used in MUC-6. This section logs changes in the latest version of GATE. Appendix A provides a complete change log. Added an annotation tool for the document editor: the Relation Annotation Tool (RAT). It is designed to annotate a document with ontology instances and to create relations between annotations with ontology object properties. It is close and compatible with the Ontology Annotation Tool (OAT) but focus on relations between annotations. See section 14.7 for details. Added a new scriptable controller to the Groovy plugin, whose execution strategy is controlled by a simple Groovy DSL. This supports more powerful conditional execution than is possible with the standard conditional controllers (for example, based on the presence or absence of a particular annotation, or a combination of several document feature values), rich flow control using Groovy loops, etc. See section 7.16.3 for details. A new version of Alignment Editor has been added to the GATE distribution. 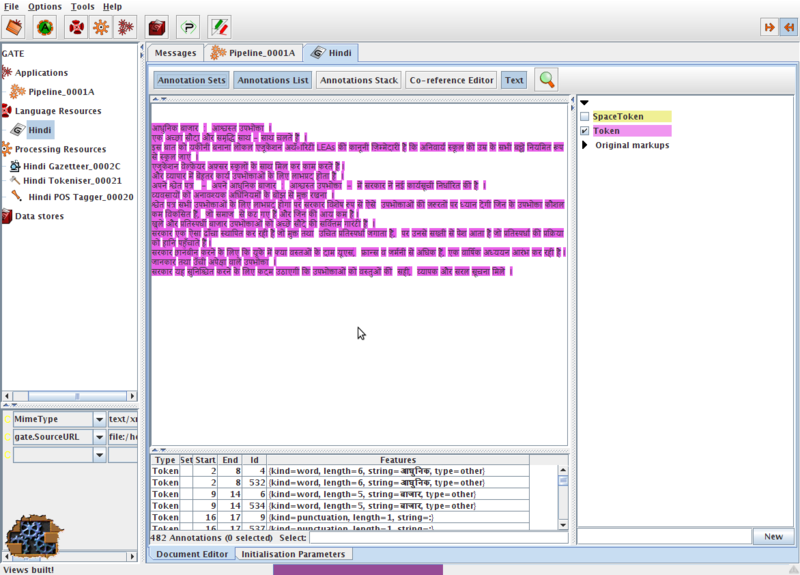 It consists of several new features such as the new alignment viewer, ability to create alignment tasks and store in xml files, three different views to align the text (links view and matrix view - suitable for character, word and phrase alignments, parallel view - suitable for sentence or long text alignment), an alignment exporter and many more. See chapter 16 for more information. MetaMap, from the National Library of Medicine (NLM), maps biomedical text to the UMLS Metathesaurus and allows Metathesaurus concepts to be discovered in a text corpus. The Tagger_MetaMap plugin for GATE wraps the MetaMap Java API client to allow GATE to communicate with a remote (or local) MetaMap PrologBeans mmserver and MetaMap distribution. This allows the content of specified annotations (or the entire document content) to be processed by MetaMap and the results converted to GATE annotations and features. See section 19.18 for details. A new plugin called Web_Translate_Google has been added with a PR called Google Translator PR in it. It allows users to translate text using the Google translation services. See section 19.8 for more information. New Gazetteer Editor for ANNIE Gazetteer that can be used instead of Gaze. It uses tables instead of text area to display the gazetteer definition and lists, allows sorting on any column, filtering of the lists, reloading a list, etc. See section 13.2.2. Changed the semantics of the ontology-aware matching mode in JAPE to take account of the default namespace in an ontology. Now class feature values that are not complete URIs will be treated as naming classes within the default namespace of the target ontology only, and not (as previously) any class whose URI ends with the specified name. This is more consistent with the way OWL normally works, as well as being much more efficient to execute. See section 14.10 for more details. Updated the WordNet plugin to support more recent releases of WordNet than 1.6. The format of the configuration file has changed, if you are using the previous WordNet 1.6 support you will need to update your configuration. See section 19.9 for details. The concept of templates has been introduced to JAPE. This is a way to declare named “variables” in a JAPE grammar that can contain placeholders that are filled in when the template is referenced. See section 8.1.5 for full details. Added a new API to the CREOLE registry to permit plugins that live entirely on the classpath. CreoleRegister.registerComponent instructs the registry to scan a single java Class for annotations, adding it to the set of registered plugins. See section 7.3 for details. Maven artifacts for GATE are now published to Ontotext’s public Maven repository. See section 2.5.1 for details. Bugfix: DocumentImpl no longer changes its stringContent parameter value whenever the document’s content changes. Among other things, this means that saved application states will no longer contain the full text of the documents in their corpus, and documents containing XML or HTML tags that were originally created from string content (rather than a URL) can now safely be stored in saved application states and the GATE Developer saved session. A processing resource called Quality Assurance PR has been added in the Tools plugin. The PR wraps the functionality of the Quality Assurance Tool (section 10.3). A new section for using the Corpus Quality Assurance from GATE Embedded has been written. See section 10.3. Added new parameters and options to the LingPipe Language Identifier PR. (section 19.16.5), and corrected the documentation for the LingPipe POS Tagger (section 19.16.3). In the document editor, fixed several exceptions to make editing text with annotations highlighted working. So you should now be able to edit the text and the annotations should behave correctly that is to say move, expand or disappear according to the text insertions and deletions. Options for document editor: read-only and insert append/prepend have been moved from the options dialogue to the document editor toolbar at the top right on the triangle icon that display a menu with the options. See section 3.2. Added new parameters and options to the Crawl PR and document features to its output; see section 19.5 for details. Fixed a bug where ontology-aware JAPE rules worked correctly when the target annotation’s class was a subclass of the class specified in the rule, but failed when the two class names matched exactly. Added the current Corpus to the script binding for the Groovy Script PR, allowing a Groovy script to access and set corpus-level features. Also added callbacks that a Groovy script can implement to do additional pre- or post-processing before the first and after the last document in a corpus. See section 7.16 for details. parts of the requirements analysis that version 3 was based on. For more details about Sheffield University’s work in human language processing see the NLP group pages or A Definition and Short History of Language Engineering ([Cunningham 99a]). For more details about Information Extraction see IE, a User Guide or the GATE IE pages. reviews the current state of the art in email processing and communication research, focusing on the roles played by email in information management, and commercial and research efforts to integrate a semantic-based approach to email. investigates two techniques for making SVMs more suitable for language learning tasks. Firstly, an SVM with uneven margins (SVMUM) is proposed to deal with the problem of imbalanced training data. Secondly, SVM active learning is employed in order to alleviate the difficulty in obtaining labelled training data. The algorithms are presented and evaluated on several Information Extraction (IE) tasks. presents our approach to automatic patent enrichment, tested in large-scale, parallel experiments on USPTO and EPO documents. presents Question-based Interface to Ontologies (QuestIO) - a tool for querying ontologies using unconstrained language-based queries. presents a semantic-based prototype that is made for an open-source software engineering project with the goal of exploring methods for assisting open-source developers and software users to learn and maintain the system without major effort. describes our SVM-based system and several techniques we developed successfully to adapt SVM for the specific features of the F-term patent classification task. reviews the recent developments in applying geometric and quantum mechanics methods for information retrieval and natural language processing. investigates the state of the art in automatic textual annotation tools, and examines the extent to which they are ready for use in the real world. discusses methods of measuring the performance of ontology-based information extraction systems, focusing particularly on the Balanced Distance Metric (BDM), a new metric we have proposed which aims to take into account the more flexible nature of ontologically-based applications. investigates NLP techniques for ontology population, using a combination of rule-based approaches and machine learning. presents the QuestIO system a natural language interface for accessing structured information, that is domain independent and easy to use without training. describes an ontologically based approach to multi-source, multilingual information extraction. presents a controlled language for ontology editing and a software implementation, based partly on standard NLP tools, for processing that language and manipulating an ontology. proposes a methodology to capture (1) the evolution of metadata induced by changes to the ontologies, and (2) the evolution of the ontology induced by changes to the underlying metadata. describes the development of a system for content mining using domain ontologies, which enables the extraction of relevant information to be fed into models for analysis of financial and operational risk and other business intelligence applications such as company intelligence, by means of the XBRL standard. describes experiments for the cross-document coreference task in SemEval 2007. Our cross-document coreference system uses an in-house agglomerative clustering implementation to group documents referring to the same entity. describes the application of ontology-based extraction and merging in the context of a practical e-business application for the EU MUSING Project where the goal is to gather international company intelligence and country/region information. introduces a hierarchical learning approach for IE, which uses the target ontology as an essential part of the extraction process, by taking into account the relations between concepts. proposes some new evaluation measures based on relations among classification labels, which can be seen as the label relation sensitive version of important measures such as averaged precision and F-measure, and presents the results of applying the new evaluation measures to all submitted runs for the NTCIR-6 F-term patent classification task. describes the algorithms and linguistic features used in our participating system for the opinion analysis pilot task at NTCIR-6. describes our SVM-based system and the techniques we used to adapt the approach for the specifics of the F-term patent classification subtask at NTCIR-6 Patent Retrieval Task. studies Japanese-English cross-language patent retrieval using Kernel Canonical Correlation Analysis (KCCA), a method of correlating linear relationships between two variables in kernel defined feature spaces. (Proceedings of the 5th International Semantic Web Conference (ISWC2006)) In this paper the problem of disambiguating author instances in ontology is addressed. We describe a web-based approach that uses various features such as publication titles, abstract, initials and co-authorship information. presents an ontology learning approach that 1) exploits a range of information sources associated with software projects and 2) relies on techniques that are portable across application domains. describes work in progress concerning the application of Controlled Language Information Extraction - CLIE to a Personal Semantic Wiki - Semper- Wiki, the goal being to permit users who have no specialist knowledge in ontology tools or languages to semi-automatically annotate their respective personal Wiki pages. studies a machine learning algorithm based on KCCA for cross-language information retrieval. The algorithm is applied to Japanese-English cross-language information retrieval. discusses existing evaluation metrics, and proposes a new method for evaluating the ontology population task, which is general enough to be used in a variety of situation, yet more precise than many current metrics. describes an approach that allows users to create and edit ontologies simply by using a restricted version of the English language. The controlled language described is based on an open vocabulary and a restricted set of grammatical constructs. describes the creation of linguistic analysis and corpus search tools for Sumerian, as part of the development of the ETCSL. proposes an SVM based approach to hierarchical relation extraction, using features derived automatically from a number of GATE-based open-source language processing tools. (Proceedings of Fifth International Conference on Recent Advances in Natural Language Processing (RANLP2005)) It is a full-featured annotation indexing and search engine, developed as a part of the GATE. It is powered with Apache Lucene technology and indexes a variety of documents supported by the GATE. presents the ONTOSUM system which uses Natural Language Generation (NLG) techniques to produce textual summaries from Semantic Web ontologies. is an overview of the field of Information Extraction for the 2nd Edition of the Encyclopaedia of Language and Linguistics. is an overview of the field of Software Architecture for Language Engineering for the 2nd Edition of the Encyclopaedia of Language and Linguistics. (Euro Interactive Television Conference Paper) A system which can use material from the Internet to augment television news broadcasts. (World Wide Web Conference Paper) The Web is used to assist the annotation and indexing of broadcast news. (Second European Semantic Web Conference Paper) A system that semantically annotates television news broadcasts using news websites as a resource to aid in the annotation process. (Proceedings of Sheffield Machine Learning Workshop) describe an SVM based IE system which uses the SVM with uneven margins as learning component and the GATE as NLP processing module. (Proceedings of Ninth Conference on Computational Natural Language Learning (CoNLL-2005)) uses the uneven margins versions of two popular learning algorithms SVM and Perceptron for IE to deal with the imbalanced classification problems derived from IE. (Proceedings of Fourth SIGHAN Workshop on Chinese Language processing (Sighan-05)) a system for Chinese word segmentation based on Perceptron learning, a simple, fast and effective learning algorithm. (University of Sheffield-Research Memorandum CS-05-10) User-Friendly Ontology Authoring Using a Controlled Language. describes experiments on content selection for producing biographical summaries from multiple documents. (Proceedings of the 2nd European Workshop on the Integration of Knowledge, Semantic and Digital Media Technologies (EWIMT 2005))Digital Media Preservation and Access through Semantically Enhanced Web-Annotation. (Proceedings of the 2005 IEEE/WIC/ACM International Conference on Web Intelligence (WI 2005)) Extracting a Domain Ontology from Linguistic Resource Based on Relatedness Measurements. (LREC 2004) describes lexical and ontological resources in GATE used for Natural Language Generation. (JNLE) discusses developments in GATE in the early naughties. (JNLE) is the introduction to the above collection. (JNLE) is a collection of papers covering many important areas of Software Architecture for Language Engineering. (Anaphora Processing) gives a lightweight method for named entity coreference resolution. (Machine Learning Workshop 2004) describes an SVM based learning algorithm for IE using GATE. (LREC 2004) presents algorithms for the automatic induction of gazetteer lists from multi-language data. (ESWS 2004) discusses ontology-based IE in the hTechSight project. (AIMSA 2004) presents automatic creation and monitoring of semantic metadata in a dynamic knowledge portal. describes an approach to mining definitions. describes a sentence extraction system that produces two sorts of multi-document summaries; a general-purpose summary of a cluster of related documents and an entity-based summary of documents related to a particular person. (NLDB 2004) looks at ontology-based IE from parallel texts. (NLPXML-2003) looks at GATE for the semantic web. (Corpus Linguistics 2003) describes GATE as a tool for collaborative corpus annotation. (Technical Report) discusses semantic web technology in the context of multimedia indexing and search. (HLT-NAACL 2003) describes experiments with geographic knowledge for IE. (EACL 2003) looks at the distinction between information and content extraction. (Recent Advances in Natural Language Processing 2003) looks at semantics and named-entity extraction. (ACL Workshop 2003) describes NE extraction without training data on a language you don’t speak (!). (EACL 2003) discusses robust, generic and query-based summarisation. (Data and Knowledge Engineering) discusses multimedia indexing and search from multisource multilingual data. (EACL 2003) discusses event co-reference in the MUMIS project. (HLT-NAACL 2003) presents the OLLIE on-line learning for IE system. (Recent Advances in Natural Language Processing 2003) discusses using parallel texts to improve IE recall. (LREC 2002) report results from the EMILLE Indic languages corpus collection and processing project. (ACl 2002 Workshop) describes how GATE can be used as an environment for teaching NLP, with examples of and ideas for future student projects developed within GATE. (NLIS 2002) discusses how GATE can be used to create HLT modules for use in information systems. (TALN 2002, DAARC 2002, MSc thesis) describe the shallow named entity coreference modules in GATE: the orthomatcher which resolves pronominal coreference, and the pronoun resolution module. (Computers and the Humanities) describes the philosophy and motivation behind the system, describes GATE version 1 and how well it lived up to its design brief. (ACL 2002) describes the GATE framework and graphical development environment as a tool for robust NLP applications. (DAARC 2002, MSc thesis) discuss lightweight coreference methods. (Master Thesis) looks at text summarisation using GATE. (ACL 2002) looks at text summarisation using GATE. (ACL 2002 Summarisation Workshop) describes using GATE to build a portable IE-based summarisation system in the domain of health and safety. (AIMSA 2002) describes the adaptation of the core ANNIE modules within GATE to the ACE (Automatic Content Extraction) tasks. (Nordic Language Technology) describes various Named Entity recognition projects developed at Sheffield using GATE. (JNLE) describes robustness and predictability in LE systems, and presents GATE as an example of a system which contributes to robustness and to low overhead systems development. (LREC 2002) discusses the feasibility of grammar reuse in applications using ANNIE modules. (LREC 2002, SPLPT 2002) describes how ANNIE modules have been adapted to extract information for indexing multimedia material. (LREC 2002) describes GATE’s enhanced Unicode support. (RANLP 2001) discusses a project using ANNIE for named-entity recognition across wide varieties of text type and genre. (COLING 2000, technical report) describe a prototype of GATE version 2 that integrated with the EUDICO multimedia markup tool from the Max Planck Institute. (PhD thesis) defines the field of Software Architecture for Language Engineering, reviews previous work in the area, presents a requirements analysis for such systems (which was used as the basis for designing GATE versions 2 and 3), and evaluates the strengths and weaknesses of GATE version 1. (OntoLex 2000, LREC 1998) presents GATE’s model of Language Resources, their access and distribution. (LREC 2000) taxonomises Language Engineering components and discusses the requirements analysis for GATE version 2. (COLING 2000, AISB 1999) summarise experiences with GATE version 1. (technical reports) document early versions of JAPE (superseded by the present document). (LREC 2000) discusses experiences in the Svensk project, which used GATE version 1 to develop a reusable toolbox of Swedish language processing components. (technical report) surveys users of GATE up to mid-2000. (Vivek) presents the EMILLE project in the context of which GATE’s Unicode support for Indic languages has been developed. (JNLE) reviewed and synthesised definitions of Language Engineering. (ECAI 1998, NeMLaP 1998) report work on implementing a word sense tagger in GATE version 1. (ANLP 1997) presents motivation for GATE and GATE-like infrastructural systems for Language Engineering. (manual) was the guide to developing CREOLE components for GATE version 1. (TIPSTER) discusses a selection of projects in Sheffield using GATE version 1 and the TIPSTER architecture it implemented. (COLING 1996, AISB Workshop 1996, technical report) report early work on GATE version 1. (manual) was the user guide for GATE version 1. (ICTAI 1996, TIPSTER 1997, NeMLaP 1996) report work on GATE version 1. (manual) describes the language processing components distributed with GATE version 1. (NeMLaP 1994, technical report) argue that software engineering issues such as reuse, and framework construction, are important for language processing R&D. 2If you’ve read the overview on GATE.ac.uk you may prefer to skip to Section 1.1. 3Rumours that we’re planning to send several of the development team to Antarctica on one-way tickets are false, libellous and wishful thinking. 4Our philosophy is reuse not reinvention, so we integrate and interoperate with other systems e.g. : LingPipe, OpenNLP, UIMA, and many more specific tools. 5This is the figure for direct Sheffield-based investment only and therefore an underestimate. 6GATE Developer and GATE Embedded are bundled, and in older distributions were referred to just as ‘GATE’. 7Follow the ‘support’ link from the GATE web server to subscribe to the mailing list. 8The terms ‘resource’ and ‘component’ are synonymous in this context. ‘Resource’ is used instead of just ‘component’ because it is a common term in the literature of the field: cf. the Language Resources and Evaluation conference series [LREC-1 98, LREC-2 00]. 9The main JAR file (gate.jar) supplies the framework. Built-in resources and various 3rd-party libraries are supplied as separate JARs; for example (guk.jar, the GATE Unicode Kit.) contains Unicode support (e.g. additional input methods for languages not currently supported by the JDK). They are separate because the latter has to be a Java extension with a privileged security profile. 10JDK: Java Development Kit, Sun Microsystem’s Java implementation. Unicode support is being actively improved by Sun, but at the time of writing many languages are still unsupported. In fact, Unicode itself doesn’t support all languages, e.g. Sylheti; hopefully this will change in time. 11Perhaps because Outlook Express trashed her mail folder again, or because she got tired of Microsoft-specific viruses and hadn’t heard of Netscape or Emacs. 12While developing, she uses a file:/… URL; for deployment she can put them on a web server. 13Languages other than Java require an additional interface layer, such as JNI, the Java Native Interface, which is in C.